Defence Minister Christopher Pyne has laid out Australia’s ambitions and commitment to Indo-Pacific Asia’s continuing peace, prosperity and stability in his keynote address at the Fullerton Forum in Singapore. As part of his third visit to Singapore in just over a year, Defence Minister Christopher Pyne was joined by Singaporean Defence Minister Dr Ng Eng Hen as he outlined the growing role of Australia in Indo-Pacific Asia and the government’s commitment to ensure the region’s emerging security and economic challenges provide equal opportunity for all regional partners. the need for greater regional capability. The Pacific Step Up strategy incorporates a number of different focuses, ranging from economic and infrastructure development, combined with a renewed Australian strategic and defence commitment to the broader Pacific region, which were outlined by Prime Minister Scott Morrison as part of the 2018 APEC leadership conference in Port Moresby. As part of Australia stepping up it’s commitment and presence in the Pacific, the government announced a $2 billion Australian Infrastructure Financing Facility for the Pacific, which was created with the view of supporting the economic and infrastructure development of key partners in the Pacific region in particular. Australia will also provide training and infrastructure upgrades to support the domestic security and defence capabilities of regional partners like Vanuatu, with the Prime Minister outlining an expansion of the island nation’s police force and the appointment of a new Australian defence adviser in Vanuatu. Another example is the recent signing of a major joint initiative between the governments of Australia and Papua New Guinea on the construction of the Lombrum Naval Base on Manus Island. “Last year, at the invitation of the Papua New Guinean government, Australia has agreed to a major joint initiative which will see the development of the Lombrum Naval Base, the old HMAS Tarangau, on Manus Island. This will create a vital operating base for the Papua New Guinea Defence Force and the Royal Australian Navy,” Minister Pyne told the Fullerton Forum. Minister Pyne also reinforced the Australian government’s 30-year, $2 billion Pacific Maritime Security Program, which incorporates the Pacific Patrol Boat program, supporting the delivery of 21 patrol boats built by Australia’s defence industry to regional nations. 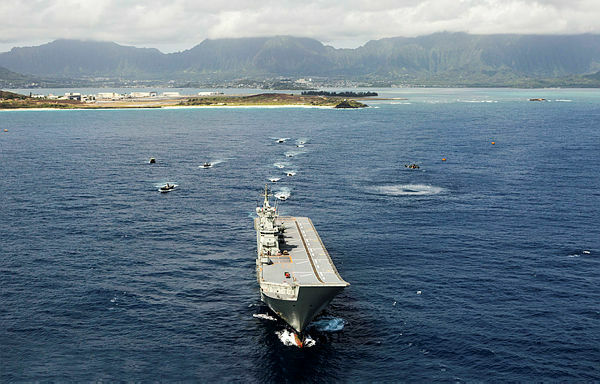 Building on these factors, Defence will play a critical role in implementing the Pacific Step Up program, providing training, support and officer development, providing people-to-people connections and the introduction of specialised, large-hulled, multi-purpose amphibious ship to support increased engagement in the Pacific region. In an apparent partial return to the concept of “Forward Defence”, the 2019 iteration of Indo-Pacific Endeavour will focus on Australia serving as a major coalition builder in the region, supporting the deployment of a major military task group to the region. The 2018 exercise will also see renewed Australian focus on the Indian Ocean, recognising the importance of growing and nurturing economic and, critically, defence and strategic relationships with key Indian Ocean nations, including rising superpower India, Sri Lanka, Indonesia, Malaysia, Thailand, Vietnam and Singapore. “In 2019, the focus of Indo-Pacific Endeavour will be the Indian Ocean, in recognition of the Indian Ocean region’s rapid economic transformations and increasing strategic competition. IPE demonstrates how Australia’s strategy for proactive engagement depends on our ability to grow the depth and sophistication of how we work and operate together,” Minister Pyne said. This renewed focus on the Indian Ocean region belies a broader reinvigorated Australian focus on the broader region, particularly relationship building with 50 per cent of the world’s population and the 12 member states of the G20, including the three largest economies in the world, Indo-Pacific nations and the world’s busiest sea lanes and seaports, each of which are essential to Australia’s continuing period of economic growth and prosperity. The mounting great power rivalry between the US and China in particular is an area of growing focus for Australia as it becomes increasingly torn between it’s largest economic partner and traditional security benefactor. “Australia shares the ambitions of those that want a region where countries have the freedom to make their own choices. Countries will be more secure in a region characterised by respect for international law and other norms, where disputes are resolved peacefully, without the threat or use of coercion or force,” Minister Pyne said. This reinforced the Australian government’s commitment to establishing and maintaining open lines of dialogue between the major global and regional players to ensure that any situation can be resolved amicably, to the benefit of all nations, not just a select few. Minister Pyne turned his attention to the growing deterrence capabilities of Australia and the reinvigorated focus on developing an unprecedented suite of Australian capabilities. In particular, the minister highlighted the $90 billion sovereign shipbuilding program, along with key capability acquisitions as part of the government's $200 billion decade-long commitment to developing the most capable Australian defence capability since the Second World War. “We are investing over 90 billion Australian dollars in a fleet of 55 leading‑edge ships, 12 Attack Class submarines, nine Hunter Class anti‑submarine warfare frigates, 12 Arafura Class offshore patrol vessels, one hydrographic ship, and 21 Guardian Class patrol boats for Pacific Island countries and Timor Leste,” Minister Pyne said. Minister Pyne was clear in identifying that while the Australian government was not actively seeking conflict, it was committed to developing a credible force to deter coercion against Australia or her national interests throughout the region. This commitment also extends to countering the rising challenges presented by asymmetric threats, organised criminal organisations and cyber security threats.